What is hCG Human Chorionic Gonadotropin? Human chorionic gonadotropin (hCG) is the pregnancy hormone which is produced by the placenta soon after implantation. Implantation takes places around six to twelve days after ovulation or about five days before a missed period. After the implantation, the hormone enters the blood stream. It shows up in the blood within two to three days and in urine within three to four days of implantation. The pregnancy blood or a pregnancy serum test detects the exact amount of the hormone in the blood (2). The test shows positive during a missed period (1). Once the fertilized egg attaches to the uterine wall, the hCG levels rise rapidly. The levels increase throughout the first trimester and reach a peak at around 60 to 80 days after fertilization (3). Now is when you experience early pregnancy symptoms such as sore breasts, irregular spotting, vomiting, or pelvic pain, for which you should go for a pregnancy blood test for confirmation. Normal hCG Doubling Time And How Often Does hCG Double? hCG doubles every 48 to 72 hours in early pregnancy, and there will be no normal hCG value in the first trimester. On an average, the levels double every 30.9 hours until they reach 6500 mlU/ml in the eighth week of the last menstrual period (LMP). After this, the levels increase considerably and peak between ninth and twelfth week. The hCG levels then decrease slightly from the 12th to 16th week, after which the levels remain constant until the end of pregnancy (4). A 48-hour increase in hCG levels by 35% is considered normal (5). If the levels are above 6000 mlU/ml, it takes around four or more days for the value to double. When the hCG values reach up to 7200 mlU/ml, you can see a yolk sac. When the levels are greater than 10800 mlU/ml, you can see a visible embryo with a heartbeat. below five mlU/ml for women pregnant who are not. The normal hcg levels for postmenopausal women go up tp 14 mlU/ml. If the hCG levels are between 5 and 25 mlU/ml, it is considered “equivocal”. It means you may or may not be pregnant and you would have to repeat the test. 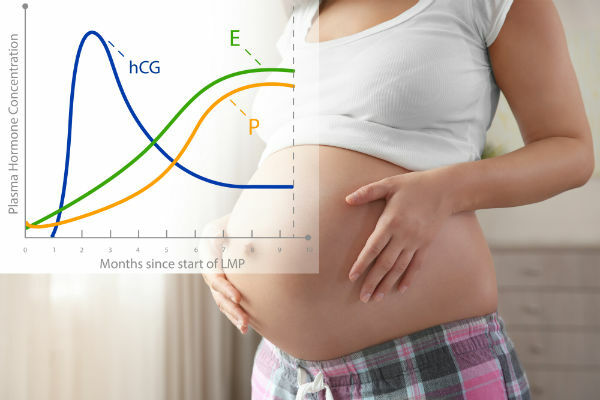 If hCG levels are above 25 mlU/ml, you are pregnant. What Is hCG Pregnancy Test? The hCG pregnancy test helps you determine whether or not you are pregnant. If your blood shows hCG, then you are pregnant. With the progressing pregnancy, the hCG levels will fluctuate a lot and there will be several normal levels. Dropping hCG levels indicate that pregnancy is not viable. It is usually associated with failed pregnancies such as chemical pregnancies or miscarriages. Slow rise hCG levels are linked to miscarriages or ectopic pregnancies (6). A decline in hCG levels that is slower than 21% to 35% in 48 hours is abnormal and is associated with ectopic pregnancies or the presence of trophoblastic tissue (7). Also, if the hCG levels are above 6000 mlU/ml, it is not easy to detect the possibility of the pregnancy. Here, a sonogram is the best option to know the pregnancy status. What Is An hCG Level Calculator? hCG calculator is a tool for detecting whether or not you are pregnant and if the pregnancy is progressing normally. You can use it to calculate the hCG doubling time by using two consecutive hCG levels, the number of days past ovulation, and the time between the tests. Once you provide these values, hcg levels calculator will automatically calculate the results. It creates an hCG levels chart which allows you to monitor the increase associated with the low, average, and high hCG levels. A twin pregnancy cannot be detected from hCG values. The hCG levels rise faster in case of twins, but there isn't much scientific data on this. However, more than one fetus could have variatious reasons. It is a quantitative hCG test that measures the amount of hCG hormone in the blood and can detect pregnancy at a much earlier stage, i.e., as early as two to three days following implantation, or eight to nine days following fertilization. Urine hCG levels are lower than blood hCG levels, and thereby blood hCG test is more sensitive and reliable. It also helps in managing pregnancy problems. Beta hCG levels double every two days in the first four weeks of pregnancy. Blood hCG tests are not helpful to understand the viability of pregnancy if the levels are over 6,000 mlU/ml, or after you are six to seven weeks into pregnancy. In such cases, an ultrasound is more helpful. hCG levels are higher when carrying a female baby than a male baby. hCG test is useful in assessing pregnancy before the fetal heart rate is detected (that is before six to seven weeks into pregnancy). It helps in ruling out an early miscarriage or ectopic pregnancy. The hCG level increases slowly above 6,000 mlU/ml, and these levels say nothing about the progression of pregnancy. After two to three months, hCG levels slow down further, and then plateau before delivery. Q. What is doubling time? Doubling time refers to the time it takes for the hCG levels to increase after the embryo implants in the uterus. Doubling time is important because an increasing hCG levels are a sign of healthy pregnancy. Q. How often does hCG double? If the hCG levels are less than 1,200 mIU/ml (mili International Unit / mililiter), they can double in 48-72 hours. And if the levels are between 1,200 and 6,000 mIU/ml, they double in 72-96 hours. The hCG levels hit their peak during the initial weeks of your pregnancy, between the 8th and 11th week. However, as you move further in your pregnancy and reach the final trimester, the hCG levels in your body start to decline. Q. How can you calculate doubling time? To calculate your hCG levels, you will have to enter the data from two beta hCG samples. The hcg levels calculator will check the doubling time between the two levels. You have to first enter the value of your first hCG test levels. Then enter value of the second hCG test levels. Mention the time gap between the two hCG tests. Then click on the ‘calculate’ button to get the results. According to the researchers at the University of Pennsylvania School of Medicine, if you have a successful intrauterine pregnancy, the levels of hCG will increase by about 35% within 2 days. Q. How much should your hCG levels increase in a week? In a majority of normal pregnancies, the hCG levels double in 48-72 hours, it means that they could possibly double twice in a week. As the levels increase and your pregnancy progresses, the doubling could take 96 hours. However, if your hCG levels are increasing at a lower rate, do not panic. It could still be a healthy pregnancy. Q. How can you increase your hCG levels in your early pregnancy? There is no scientific and medical way through which you can safely and assuredly increase your hCG levels. There are some supplements available in the market but they are not regulated by the FDA. Do not try them as they could harm your pregnancy. If you are worried that your hCG levels are not in the normal range, speak to your doctor about your concerns and follow proper medical advice. Q. What is a bhCG test? A bhCG test refers to a Beta Human Chorionic Gonadotropin test. While an hCG test is done through a urine sample, the bhCG test is performed on your blood sample. The bhCG test checks for a confirmed pregnancy and results will usually show as positive when you miss your first period. Your lab technician will take a small sample of blood from your vein to carry out the test. Q. Can You Have hCG Levels Even If You Are Not Pregnant? A biochemical pregnancy: One of the first reasons of positive hCG levels could be that you go through a biochemical pregnancy, which means that you do become pregnant, but you lose the fetus even before you realize that you are pregnant. The hCG levels take some time to leave your body, and when this happens you may still end up seeing it in your test results. Also, the results pick up the slightest amount of hCG levels. Pituitary hCG: While hCG is produced by the placenta, sometimes, it is also produced by your pituitary gland in your brain. The pituitary gland secretes various hormones that help to control your endocrine organ systems (such as reproductive organs, thyroid, pancreas and more). The pituitary gland secretes three other hormones (the thyroid stimulating hormones, the luteinizing hormone and the follicle stimulating hormone), which are very similar to the hCG hormone. If your hCG is indeed secreted by the pituitary gland, the levels will not increase the way they do if you are pregnant. Cancerous cells: In some cases, the hCG hormone is also produced if you have any cancerous cells in your body. Interference from antibodies: It is possible that you have some antibodies in your blood that interfere in your hCG test and show a false presence or a false high count. However, it will only happen when you take the blood sample test. Q. Can your hCG levels drop even if you are pregnant? If you notice that your hCG levels are dropping even if you do have a confirmed pregnancy, it could mean quite a few things. Firstly, it could mean that you possibly have irregular menstrual cycles, or your menstrual cycles are longer than most women. Secondly, a drop in the levels of hCG could mean that you may have an ectopic pregnancy or a miscarriage. A study was conducted in which a pregnant woman had dropping levels of the hCG hormone, and even though her physician felt it was a case of miscarriage or a non-viable pregnancy, later tests revealed that she could go ahead with the pregnancy. Q. Can you test your hCG levels at home? Most home pregnancy test kits detect and measure hCG levels in the urine, but don't display the exact hCG levels. Unless you are using a digital pregnancy test kit, which records the exact hCG levels in your urine, you cannot determine the hCG amounts through a home test. Disclaimer: One of your first brushes with hCG will be when you take a home pregnancy test or get a blood test done to determine whether or not you are pregnant. Whatever your results, make sure you run them by your doctor to know exactly what's happening. It's possible that the hCG levels may sometimes also show a false reading, it is best to get it checked through your medical care professional. Moms, did you take a urine test or blood test to check your pregnancy status? Did the results come out accurate or were you confused? 1: Fritz MA, Guo SM. Doubling time of human chorionic gonadotropin (hCG) in early normal pregnancy: relationship to hCG concentration and gestational age. Fertil Steril. 1987 Apr;47(4):584-9. PubMed PMID: 2436952. Konrad G. First-trimester bleeding with falling HCG: Don’t assume miscarriage. Canadian Family Physician. 2007;53(5):831-832.